Acing that tricky Job Interview! 8 Key Tips. Brilliant ! You have just been invited to an interview for that dream job. Now what? A successful interview will be essential in order for you increase your chances of getting an offer! We set out below some tips and advice on how to ace a job interview, including tips on every aspect of the interview from preparation through follow up. Research should always be your first step after accepting an interview. Gathering background information on employers is crucial to successful interview preparation. An employer will expect you to know something about the company, and expect you to know where you fit in and how you could add value to the organisation. You will need to be prepared to answer the questions, ‘Tell us a little about our company’ and ‘What attracted you to our organisation?’. Knowing as much as possible about the company’s past performance and future plans can also help you better explain how you can add value to the company. Before the interview, review the company’s website, particularly their “About Us” section. Also check out their LinkedIn, Facebook, Twitter, and Google+ pages to see what information the company is sharing. Don’t be afraid to contact your prospective employer to request details on the position you are interviewing for or to ask for company literature. Practice leads to improvements, conduct practice interviews with a friend or family member, and ask for their feedback. You can also record or videotape your responses so you can review your answers and check your body language, sitting up straight, being attentive and looking the interviewer in the eye when responding to their questions, is extremely important. Prepare answers to commonly asked interview questions, doing so will help you analyze your background and qualifications for the position giving you confidence in your answers. Prepare a list of questions that you want to ask the interviewer. Remember, you aren’t simply trying to get the job – you are also interviewing the employer to assess whether this company and the position are a good fit for you. The more you practice, the more self-assured you will feel walking in to the interview. Your answers will feel natural, and interviewers will be impressed by your confidence. It is important to know what type of interview you will have, so you can effectively prepare. For example, you will prepare slightly differently whether it is your first, second, or final interview. You will also have to practice using different technologies if it is a phone or skype or face to face. You might also have a group interview, in which you are interviewed by a panel. Make sure you know what kind of interview you will be having before you arrive. If you are unsure, do not hesitate to ask the employer or recruiter who set up the interview. Behaviour-based interviewing is becoming more common. It is based on the idea that a candidate’s past performance is the best predictor of future performance. Behavioural interviews involve you answering questions about how you have handled past situations at work. The best way to prepare is to make a list of your skills, values, and interests as well as your strengths and weaknesses. For each item on the list, consider a time when you displayed that quality. Take the time to compile a list of responses to common behavioural interview questions. When answering, describe the past situation, and how you successfully handled it. Make sure your answers are related to the job for which you are interviewing. 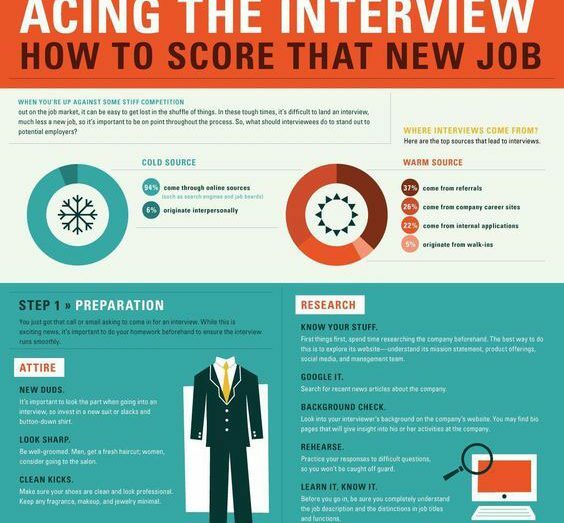 You will want to decide what to wear before the interview day. Your first impression is very important, and what you wear is a big part of that first impression. Therefore, you want to make sure you look professional and appropriate. In general, men tend to wear a dark suit and tie, and women often wear a dark suit or a shirt with dark trousers or a skirt. You should also limit accessories, and makes sure you are well groomed and your clothing fits you well. If you have Tattoos make sure they are covered up! You might be able to dress more casually for a job at a startup, or a job at a place with a casual work environment. However, when in doubt, it is better to dress more professionally than less so. Always confirm with the interviewer what is expected on the day! It is always a good idea to dress just a little bit more professionally than the dress code requires. And don’t forget the firm dry handshake, whether you are a man or woman, having to shake a limp, slightly moist hand is an unpleasant experience. It is very important to be on time for the interview. On time means ten to fifteen minutes early. Do not be late for any reason!! Make sure you know the interviewer’s name and use it as soon as possible during the interview. If you’re not sure of the name, call and ask prior to the interview. Remember to bring an extra copy of your CV and a list of references, and any work samples you want to show the employer. Remember to bring a pen and pad so you are able to make notes during the interview. It’s also important to know what not to bring or do!! . Don’t chew gum and Don’t leave your phone on (even in vibrate mode). During the interview, try to remain as calm as possible. Ask for clarification if you’re not sure what’s been asked and remember that it is perfectly acceptable to take a moment or two to frame your responses so you can be sure to fully answer the question. Also remember that thorough preparation helps build confidence and relieve stress. The more you research the company, practice answering interview questions, and prepare for the day of the interview, the more calm and confident you will feel. End the interview with a thank you to the interviewer and reiterate your interest in the position. Then follow-up with a personal thank you note or email message restating your interest. This is an opportunity to remind the employer of your qualifications, and include any details you forgot to mention in the interview.